Regular readers will have noticed that Croatia Online’s productivity has dropped somewhat over the past few weeks, for which we apologise. Similarly our friends have hopefully noticed that we’ve disappeared off the social radar. That should all change soon as the finishing touches are put to our Croatia Cruising Companion. It’s been quite an epic project but it’s now in the final stages of completion. As you can see from today’s picture, we now have a front cover, and are just waiting for a final schedule from the publishers in order to be able to announce the publication date. 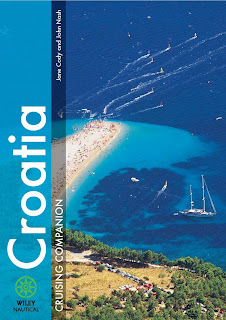 In over 250 pages of text, photos and charts, The Croatia Cruising Companion explores the Dalmatian Coast and Islands – on sea and on land. Dalmatia is undoubtedly one of the best cruising grounds in the world and we’ve covered pretty well ever inch of it, in some cases many times over, during the five years we’ve lived here. In writing The Croatia Cruising Companion, we have endeavoured to pass on that insiders’ knowledge so that others can explore the area, safely and to the full, at sea and onshore. We hope and believe it will prove to be the most up to date, comprehensive and user friendly book of its kind. We’ll let you know as soon as we have final publication details and will be resuming our regular postings just as soon as we can. There’s plenty of news to catch on but we’re in need of a short break after burning a little too much midnight oil over the last few weeks.